Oh how I love cake. Any kind of cake except for coffee cake. Every coffee cake I have ever tasted was way too dry and the crumb toppings usually just made things worse. I have always needed to down a huge glass of milk or other beverage after, so typically I don't buy or make coffee cakes because I just don't enjoy them. I recently came across the website for My Grandma's Coffee Cake and immediately noticed it said "Accept no substitutions! We are the original coffee cake from New England, guaranteed to be the best coffee cake you've ever eaten!" Needless to say I wanted to find out for myself if that was true! The fabulous folks at My Grandma's of New England agreed to send me some samples for my review and I was totally blown away when the box arrived. They sent me 2 coffee cakes to sample. One large Cinnamon Walnut and one small New England Blueberry. We launched our first My Grandma's Website in early 1998. Please click here to see our original Website! Today our line includes the New England Blueberry, Ted Williams Chocolate, Banana Walnut, Cape Cod Cranberry, Chocolate Chip, Red, White and Blue Patriot Cake, Pumpkin Spice and Lemon Poppy flavors. Our special-order "lower fat" cakes (available in all flavors but the chocolate) have become quite a popular line for My Grandma's. You just can't taste the difference! All cakes may also be special-ordered without walnuts. I couldn't wait to get these opened and try them! I was a bit skeptical because of all the previous coffee cakes I've had were dry but these were HEAVENLY. They smelled wonderful! Each one was packaged in a freezer safe plastic and placed in it's own box. The first one I sampled was the Cinnamon Walnut. I could not get over how moist this cake was! The cake was not overly sweet and tasted fabulous! You can tell they use the freshest ingredients available as the cake was definitely baked fresh before being sent out to me. The crumb topping was also fabulous with walnuts and cinnamon. They do not skimp when it comes to the walnuts either! 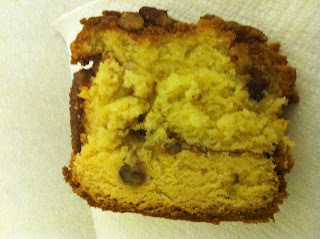 This was the BEST coffee cake I have ever eaten..seriously! I would not say this if it was not true. The second one that I got to sample was the New England Blueberry. Oh my goodness! This was equally as yummy! The cake was fresh and loaded with blueberries! Again, it was extremely moist and not overly sweet. Originally I had thought that maybe it was a gimmick by their company to say they made the best coffee cake that you've ever eaten but definitely NOT! These WERE the BEST I have EVER eaten! The large size is huge, weighing in at 3.1 lbs and will feed 16-20 people. The small weighs in at 1.75lbs and will feed 8-12 people. These would be PERFECT for any special events like Christmas morning. The only downside to these would possibly be the cost. The large coffee cakes run about $30.95 each and the small run about $21.95 so because of the price, I probably wouldn't purchase these as a just because item. I would only purchase these for special events. Overall, these were amazing and definitely the BEST coffee cake I have personally ever eaten! I would definitely purchase these again for a special event. 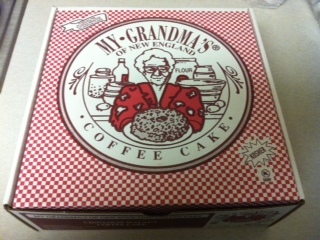 You can purchase these wonderful coffee cakes at My Grandma's of New England. Use this link and you will save $4.00 off your purchase! The fabulous people at My Grandma's of New England have agreed to give one of their coffee cakes away to one of my readers! One winner will receive their choice of a small or large coffee cake in their choice of variety! Visit My Grandma's of New England and the come back and leave a comment with which variety you would choose if you won! You must do this before any other entries will be counted. Please leave your email address as well so I can contact you if you win! -Follow my blog publicly via GFC(located in the right sidebar) Be sure to leave your GFC username in your comment. That's a total of 6 possible entries! Good Luck! You must be 18 or older to enter and live in the US. Only one person per household or IP address may enter. One winner will be picked via Random.org and will be emailed. Winner will have 48 hours to respond or a new winner will be picked. Giveaway ends Friday, July 8th at 8:00pm Eastern Time. I would pick the Granny Smith Apple coffee cake. I would choose the Granny Smith Apple Coffee Cake with the walnuts. Sounds just yummy. I'd choose the Cinnamon Walnut Coffee Cake. Drool. I would choose the Granny Smith Apple coffee cake. I'm a blog follower via GFC (wcc). I like My Grandma's of New England on Facebook (username: Les Cerises). I follow them on twitter (username: @whitechocolatec). They all look delicious! I would probably choose the Cinnamon Walnut. I would choose the Banana Walnut Coffee Cake. i would choose the Sharp and Tart Cranberries Combined with Cinnamon Sugar Sweetness. love that its made with real maple sugar. The Granny Smith apple sounds so yummy! I'm game for a Patriot cake! I would get the Large Presliced Cinnamon Walnut Coffee Cake. Yum! I follow you on twitter (prizepuzzle). I would love the lower fat cinnamond walnut coffee cake. Yum, these look great! I'd choose the Large Lower Fat New England Blueberry Coffee Cake. I would get the Granny Smith Apple coffee cake. Thanks for the chance! bringhamsweeps likes you on FB! I'll do the Cappuccino coffee cake. Like My Grandma's of New England FB as kyhere here. Following MyGrandmas twitter as ky2here1. I would choose the Cape Cod Cranberry Coffee Cake. I am now following you on twitter(terri142). I Like you on Facebook(Theresa DeRosa). I Like My Grandma's of New England on Facebook(Theresa DeRosa). I am now following MyGrandmas on twitter(terri142). OMG - The Cape Cod Cranberry Coffee Cake looks amazing! I would love to try the Granny Smith Apple Coffee Cake. I am following My Grandma's via Twitter as jlsc123. I am a fan of My Grandma's of New England via Facebook as Jill Myrick. I would get the large Cinnamon Walnut coffee cake! If lucky enough to win, I would choose the Chocolate Chip Coffee Cake, No Nuts! YUM! I already follow you publicly via GFC (Cataroo)! I already follow you on Twitter (@Kitty32504)! I already "like" you on Facebook (Dara Nix)! I "Like" My Grandma's of New England on Facebook (Dara Nix)! I'm following My Grandma's of New England on Twitter (@Kitty32504)! Pumpkin Spice Coffee Cake. YUM!! I would choose the Large Lemon Poppy Coffee Cake. I would like the chocolate chip. Yum! I would love to try the Cape Cod Cranberry Coffee Cake. Thank you for the lovely giveaway. I would like the Cinnamon Walnut Coffee cake! I'd like the Lower Fat Granny Apple Coffee Cake. I follow on Twitter @kristinnw. One of each please---but If I have to narrow it down I will go with the Cappuccino Coffee Cake--large please!!! I would choose the Large Banana Walnut Coffee Cake. I follow MY Grandma's Of New England on Twitter. The Patriot Coffee Cake sounds wonderful!